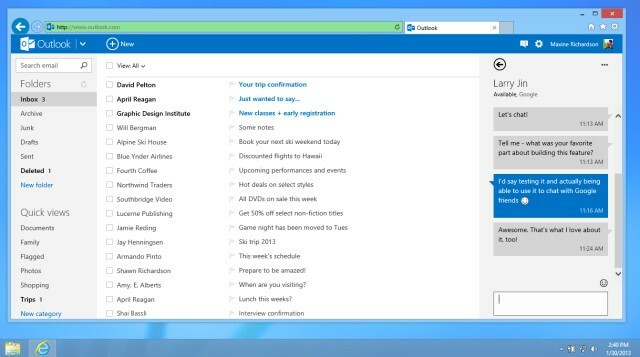 Over the next couple of days, Microsoft will be rolling out Google Talk support in its instant messaging integration for Outlook.com. They recently began rolling out Skype support, although we haven’t seen it in the US yet, and it already supports Live Messenger (which will be discontinued soon) and Facebook Messenger. Microsoft is obviously targeting the Google users and trying to pull them into their user-base. Hopefully Microsoft will integrate Google Talk into the Windows 8 and Windows Phone 8 Messaging hub and maybe the desktop Skype client. While they’re at it, they could integrate Yahoo Messenger as well and make it a true multi-protocol client to compete with IM+, Trillian, etc.